The SD card of the Raspberry Pi is required for booting. While you may not be able to boot from an external hard drive, moving the root partition there will significantly speed up the Raspberry Pi. There are many uses where this configuration particularly useful. File servers and media servers are good examples. I use a system like this for a MySQL database server. Note about the sudo command: All of the following must be done as root. You must put sudo before each of the commands. Or, you can follow the (not recommended, bad practice) habit I have and just enter sudo bash to run a shell as root and skip saying sudo all the time. 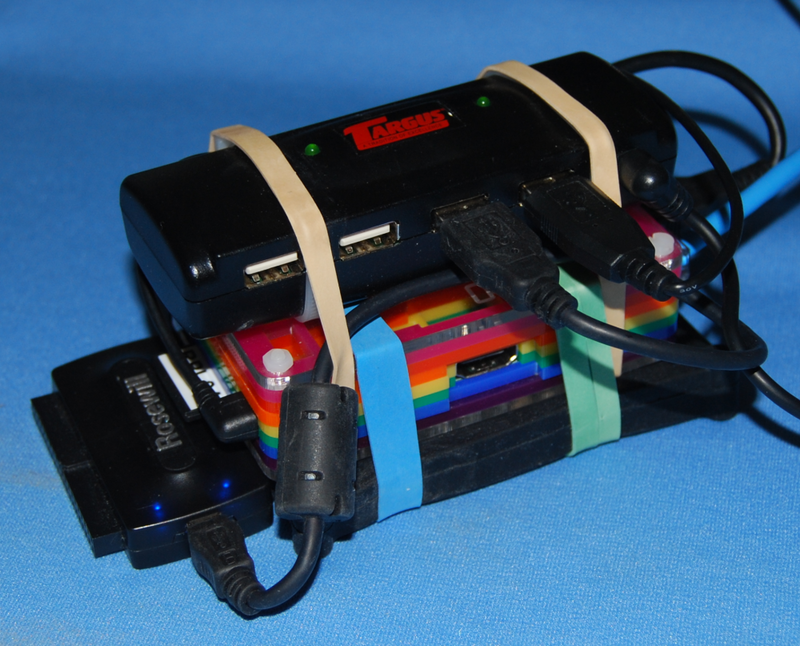 Load SD Card with Raspbian in the usual way. Update the system software and firmware with the following three commands. This can take quite a while to complete. List the partitions This should show only the /boot and / partitions on the SD card. Modify the partition table for the external drive. Delete partitions by entering “d” and then the number of the partition to delete. Delete all the partitions. Entering “p” will list the partitions. a) Create a single partition and move the root there. This will leave the swap file on the SD card. b) Create a root partition that fills most of the drive and a small swap partition. c) Create a partition for the OS, a small swap partition, and a large partition for application data. I am using the third option. The following instructions are fairly easy to change to use one of the other options. While still in the fdisk program, do these steps. - Create the root partition: I made mine 16GB. Enter “n” to create a partition, “p” to select primary partition and then “1” to select partition number one. Select the default start sector. Enter +16G to specify the size. - Create the swap partition: Enter “n” to create a partition, “p” to select primary partition and then “2” to select partition number two. Select the default start sector. Enter +2G to specify the size. Enter “t” to set the type of a partition. Enter “2” and then “82” to make this one a swap partition. - Create the data partition: Enter “n” to create a partition, “p” to select primary partition and then “3” to select partition number three. Select the default start sector and default end sector to fill up the rest of the disk. - Enter “p” to list the partitions and verify things are like you expect. - Enter “w” to write the new partition table and exit. Create (format) the data partition with an EXTv4 file system. This command takes a few minutes to finish. There is no need to format the first partition since we are going to do a raw copy of an existing file system over it anyway. Mount the new root partition. Use rsync to clone the root partition from the sdcard to the new partition on your hard disk, Note the exclude of /mnt. This takes a while. Change the mount configuration file on the new root. Add /dev/sda2 as a swap partition by adding this line. Finally, stop the system from using the swap file that it normally uses. And delete the old swap file. Use your editor of choice (I use vi) to modify the boot configuration to use the new root partition. First make a backup copy. Now the system is ready to reboot. It should come up normally with the external hard drive mounted as root. If the system fails, use another machine to copy /boot/cmdline.orig to /boot/cmdline.txt and then reboot again. One problem that some people have run into is controllers that take too long to complete the USB discovery. This can be compensated for by adding delays in the /boot/cmdline.txt file with the bootdelay and rootdelay options. I had to remove the space between the last forward slash and the "S"
Nicely done. I would recommend one addition, and one emphasis. Your mount point might differ. As a Linux/Raspberry newbie, I am trying to follow your tutorial. However, After copying the second partition, I get hundreds of error messages like "Inode not valid, recreate?" "Wrong size 4164617681 should be 0, resize?" "Superblock has an invalid journal, clear?" What does that mean, I what are the consequences of doing all of it? That is why the e2fsck command must be run. This should correct all those errors. Did you run this command? if you do this right you should have little or no errors. With this problem it is not only 2 or 3 like regularly it is literally HUNDREDS of errors I spent half an hour and never got through it in the end I corrupted the files and restarted after I realized what I had done. Thanks for step by step but it's freeze when I do the partition. Please suggest me for the solution. Be sure you are doing the partition on the correct device. It is normally /dev/sda (not /dev/sda1 and certainly not /dev/mmcblk0. Also be sure you have enough power. You should be running the external drive from a powered USB hub. Is this normal? How long could it take for resize2fs to resize to a 20GB partition (6GB were copied using dd previously)? It's an ext4 filesystem. I wouldn't expect it to take more than an hour. Probably a lot less. Did you run the e2fsck command immediately after doing the dd copy? You must do that before you try to mount the device. All I can suggest is trying again. Thank you anyway... I had to kill it, after 80 hours running still no feedback. I'll try again later. run e2fsck, fixed some errors. run resize2fs and after a few minutes it was done! Excellent clear description of how to do this. Hello. First, thanks for this post. Got it working with only minor modifications for my unique situation. The ext HDD is a Toshiba Canvio 3.0 Plus, 1.5TB. Furthermore, while I can physically power down the Pi and restart, "sudo reboot" does not seem to work: the Pi lights up, however, I cannot SSH in. As a last resort, you could do a cron job to access the drive regularly to keep it awake. This will access the device every 5 minutes. flaky USB Hub, the problems I described in my first post went away. issues, if you can, swap out your hub, just to be sure that's not the problem. A few other typos than those mentioned, above, but this noob finally figured out the problems and I seem to be running Raspbian off of the HD. It worked first shot. Does some work in the SD then the HD wakes up and starts flashing for the rest of the time and no more flashing of the SD access LED. Now we will see if there are timeout problems or anything else. Thanks for the instructions. Would be nice to do just a couple of minutes of cleanup on them and fix the remaining problems. I also had to change mmcblk0p2 to mmcblk0p6. One can tell which is should be by looking in /boot/cmdline.txt. It will have the correct name on one of the first lines. That is very kind of you to write this share for us, thanks a lot I could get lot more knowledge from your article.. thanks for sharing. I just have one question: is the SD card necessary after this process? I suppose so. So... Is everything on the SD necessary or i can use a smaller one to keep just the needed files? How can i use a really small SD to just make the Rpi boot from an USB HDD? I'm not sure if the SD card is needed once booting completes but taking it out while the Pi is running would probably be a bad idea. All that you really need to boot a system configured like this are the files on the small FAT partition at the beginning of the SD card and probably something from the boot sector of the drive. You can use a disk imaging tool (or just the dd command) to copy just that little bit and then write that to a very small SD card. I never see anything smaller than 4Gbytes these days but there are lots of older ones still around that are smaller. Beware though, some of those older SD cards may not be compatible with the Pi. for typing next xommad i need to pass enter to minicom. the -n option is suppressing the output of the trailing newline. Since you are using AT commands, I will assume that you have a modem connected to the serial port. Try using printf instead of echo. It will interpret escaped special characters. "\n" is the enter character. The exact commands and the delays needed in between will depend on your modem and the service you are connecting to. I thought the days of modems were long behind me. However, a few years ago I had to configure a Linux system to use an Iridium satellite modem. In the middle of a desert, In an "unspecified location"
Hi Ted! Can you tell me, what kind of power supply do you use for this construction? Especially, what output current is in it? The system pictured suffered a hard drive failure and the USB hub has now also failed. Typically, this type application needs about 2A of 5V current. It includes a 2.6A power supply and the system has been working great so far. I will be adding multi-segment LED displays for showing CPU and IO utilization, which will be covered in an upcoming blog post. I've always been very aware of the (lack of) performance of the Pi. Is there any sort of comparison between your setup and a vanilla one? Might I suggest a video with boot times side by side, or something like it. This is way out of my league (at least for now), but can this also be done with RaspBMC? Thanks for the how-to (kept me from guessing). I did have to reboot before "rpi-update" would work (and then rebooted again after). Thanks for the Tutorial It really helped!!! Does This Install all the operating systems that are on the SD card or just Debian? If it is not could you tell us how to move multiple operating systems onto a hard drive? These instructions were made assuming a standard image of Raspbian is used. I should have mentioned that, but it seemed obvious at the time. The popular image now is NOOBS, which let's you load one of several OSes. I plan in experimenting with NOOBS and moving all or part of it to the external drive. The same basic process described above would be used. The main difference is that NOOBS has several partitions for the different OSes so you have to know which partition to copy and how to set up the boot sequence to use the external drive. Hopefully I can get to this soon. This post gets a lot of traffic and is a bit out of date now. Excellent guide. New to the RPi platform, and this guide was exactly what I needed. Thank you for taking the time to post this. My cmdline.txt had mmcblk0p6 as the root. So i copied that instead of blk0p2. Was that alright to do? When i mounted sda1 and went to edit /mnt/etc/fstab it has mmcblk0p5 as the root, and mmcblk0p6 was listed on the next line (blk0p6 was not listed as root). I chose to change out blk0p5. I do not think it worked for me. Can anyone help me out? I follow your explanation Word by Word, and end up with a working system first time. Thats is a really GOOD toturial. Regards Ole Andersen in Denmark. Under the section "Robust mounting of multiple USB flash drives"
Great walk through. Worked like a dream first time. Only had one hitch where my SD data didn't copy over correctly the first time. After copying it over again it worked. I managed installing a "pisces" (R3 - http://www.raspbian.org/PiscesImages) "minimal" Rasbian version on a 1GB SD card. 1. Following the guide above, I installed Pisces version on a 4GB Flash, had to copy all /boot (found in the fat32 partition visible in Windows) from a "full" running Raspbian card that worked previously. No idea why the bootstrap was different - NOTE: Pisces uses /dev/mmcblk0p3 as root - experiment 2-6 on NOOB and other if needed! 3. Booted the Pisces flash with USB disk available - the fact that the USB hub powersupply supplies the Pi was a pleasant surprize. 8. Copyed everything from the 4GB Pisces SD card (used for dd'ing to USB disk - therefore 100% certainly working) /boot (visible in Windows) to the 1GB SD-card after deleting all files there. 9. Boot Rasberry Pi using bootstrap from minimal distro on 1GB SD-card with entire system on USB disk. It shouldn't take more than an hour. Probably more like ten minutes. RASPI 2 are different from the old one and the suggested procedure will have to be modified? I wouldn't expect a difference on the model 2. I just received my model 2 and will likely use it to upgrade my MySQL server, which has the hard drive. So, I will find out. The rm command is to stop the system from using the flash card for swap space. Even with no swap space the system shouldn't panic on boot. It is more likely something to do with locating the root drive. When i try to edit /mnt/etc/fstab and save the settings, i get an error saying that it cannot write to fstab because its read only system. I searched the internet for a solution, but can't find anything that seems to work. Do you have any suggestions what to do about this? Like most of the commands for this, it needs to be performed as root. Put a "sudo" in front of the edit command. I did, i used sudo su. I checked the syslog this evening and found out that the fs was going into read only mode because of a "critical target error, dev sda, sector 0". I don't know exactly what that meens but it's keeping me from write to the HDD. It looks like there is something wrong with my HDD. This HDD was used on a windows pc before and had never any kind of malfunction. But on the raspberry pi it says all the time that it's a read only system. Can i avoid that sector 0 and make partions on other places of the HDD? Or is there a way to repair that sector? Sorry for the multiple replies, but i'm trying to get this work for the past two weeks and my knowledge about linux is minimal so I'm depending on what others have to say about this problem. You can not avoid using sector zero - that is where the partition table is stored. I suggest that you make a backup of your SD card soon. You can make an image using the same diskimager program that you use when you first load the card. Another way that I have started using is the "rpi-clone.sh" script. see this link for more info. Have you ever tried this with an already running system, rather then a fresh install. Iv had mine running off the SD card for nearly 2 years now, and I think the SD card is starting to pack in. I have done everything as described, and it boots fine, except nothing will pick up my SSL certs, and some things cant find their databases, which I cant understand because everything should be mirrored. I would rather not have to start over again, Iv put alot of work into what I have. It will work the same whether it is a new install or a well used one. The process described will clone the current sdcard contents to the hard drive. Note that you still need the sdcard with the boot partition in order to boot. You could also just clone the sdcard to a new one using the "rpi-clone.sh" script. see this link for more info. Ted: Thank you for the clear instructions. I am not well versed in Linux, but was able to get a HDD hooked up and running. My problem is the drive was salvaged from an old laptop and is starting to fail. I would like to know if you can point me to a procedure where I can image (clone) the existing drive onto a new one. You may need to make some modifications to the instructions since you will already have a /dev/sda device and will be cloning to /dev/sdb so be careful about that. Hello, well written and easy to follow. Thank you. While trying to mount /sda1 I got "wrong fs type, bad option, bad superblock..."
So formatted /sda1 and tried again. Was fine this time. I am a newbie at raspberry pi. I am using raspbian jessie, I entered in sudo /dev/sda at the start and it said this file does not exist, I also tried /dev/sda1 and /dev/hda and dev/hda1 and I got the same answer. what should I do? Check the output from the lsusb command and see if the device shows up. It probably doesn't. Most likely problem is insufficient power on the USB to power the device. You often need to run this from a powered USB hub. Bus 001 Device 004: 1058:107b Western Digital Technologies, Inc.
but I just don't know how to open /dev/sda. "sudo /dev/sda" doesn't make sense. /dev/sda is a device file not a command. try entering "sudo fdisk /dev/sda" and this will run the partitioning program on the external drive (see the instructions in the post"
Just to verify that the device file exists, try "ls -al /dev/sda"
Does that show the file info or "No such file or directory"? To "open" the external device you must mount it. Assuming that it has already be partitioned and formatted, then "sudo mount /dev/sda1 /mnt" will mount the drive on the /mnt directory. Then the contents of the drive will appear there. Normally the system can tell what filesystem type the partition is using. Have you formatted yet? Run the command "mkfs.ext4 /dev/sda1" before doing the rsync command. all you need to do to change the mount configuration file on the new root? The rsync command failed once with a bunch of errors about stuff not copied, so I deleted to partition it was in and tried again. This time it got a lot farther but it failed with a few io() errors I think, then I tried to retry it but when I entered the command nothing happened. I thought it must have been fine, so I went on to the next step. When I tried typing, the arrow keys were all that worked. I then tried to reboot it in hope that the problems would be fixed. It started off fine and then the screen went black like normal but the screen never booted up again. I once saw the little square in the corner but it went away after a few seconds. I had to pull the plug after a minute. I tried to turn it on again but once it started the scrolling checks (with the four raspberries at the top), I got two red warns instead of okays. The first one said insuffiecient space on the root partition, mounting t . . . I didn't have time to read the second one before the screen went black again. it hasn't lit up since. I have used this for the last year and it works very well for me. Now I have one problem and I hope you can help me. Very clear instructions but I have tried several times and have gotten this error: rsync: write failed on "/mnt/var/swap": No space left on device (28). ERROR: sys/module/uio_pdrv_genirq/sections/__mcount_loc failed verification -- update discarded. I thought I was running out of space so I used 32G for the OS partition to no avail. I even switched over to Raspbian Lite, again no joy. /mnt/var/swap is the old swap file. It should have been deleted and the init script to use it should also have been deleted. I just read your article and found it very informative. I remember how hard it was for me to find the right type of external hard drive for my needs. Well, if someone is looking to buy an external hard drive then I'd love to recommend this list of external hard drives where you will find the best one for your specific needs. 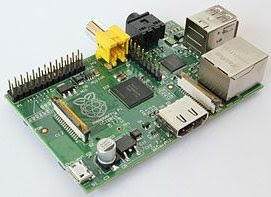 The Raspberry Pi is a credit card sized single-board computer developed in the UK by the Raspberry Pi Foundation and based on the Broadcom BCM2835 system on a chip. This US$35 board is intended to stimulate the teaching of basic computer science in schools. It's also a great item for hobbyists. I'm a long time electronics hobbyist with a great interest in the Arduino microcontroller and the Raspberry Pi single board computer. Both are great for teaching kids about electronics and computers, which is my other great hobby. These blogs will be used to document and share my projects for students and fellow hobbyists.